Whatever your requirements are, at Filtap, we’ve got the perfect under sink water filter for you. Make a selection from our impressive range below. Each of our systems below are built to fit neatly under your sink, and they’re compact enough to still give you plenty of storage space for other items in the cupboard. All of our under sink water filters come with a complimentary designer tap. This means you can use the filtered water for drinking and cooking, while having regular tap water for washing hands, etc. Additionally, you can be sure that the new tap and pipe installation is clean so that your filtered water remains perfectly pure all the way from the filter to your glass. While there are a number of reasons why you may choose one of our under sink water filters over another, all of our filters are amazing at taking out elements and organisms you don’t want in your water. All of our filters will take out chlorine, algae, aluminium, lead, iron, E-Coli, parasites, dirt, rust, mercury, ammonia, asbestos and much more. You can be confident that no matter which under sink water filter you choose, it will help protect you from harmful chemicals. Our 5-stage reverse osmosis system is definitely the best though, as it can take out even the smallest substances such as fluoride. If you haven’t yet decided which under sink water filter is the best option for your home or office, we’ve given a description of each below. Our friendly and experienced team are always happy to help too and you can speak to one of us by calling 1300 734 156. The twin under sink water filter is our most basic option, however, it’s definitely far from basic! Most water filters that people get installed from other shops include just one cartridge, which means your water isn’t as pure and the filter doesn’t last as long. With a 1 micrometre (0.001 millimetre) sediment prefilter and 0.4 micrometre carbon post-filter, your water gets filtered twice, and you can understand that there’s not much that could fit through something that small. If you’d like to know more about our two-stage under sink water filter, head over to its page and download the brochure which will give you all the details of what this amazing compact filter can do. We invested years of research developing our filters and we know you won’t be disappointed with their performance or value for money. 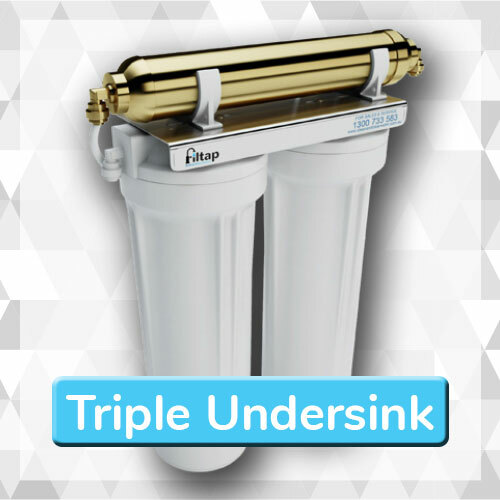 The triple under sink water filter is our next step up from the twin, in addition to the 1 micrometre and 0.4 micrometre filters it has a Gold Series super fine coconut carbon cartridge that gives your water a final ‘polish’. This extra cartridge is what takes away any bitterness, bad taste, or odours that may manage to make their way through the first two chambers and into your water. If you’ve got particularly bad tasting water, the triple under sink (three-stage) filter would be a wise choice over the twin. While all our water filters can help make the dirtiest of water safe to drink, having the added peace of mind of the triple under sink water filter is a choice that many Sydney residents prefer. All of the details about our three-stage triple under sink filters can be found on their information page, with all the technical details you may like to know about it in the PDF brochure that is available for download. Our experienced team can also assist you with any questions you may have regarding any of our filters, so don’t hesitate to contact us if you’d like to know more. 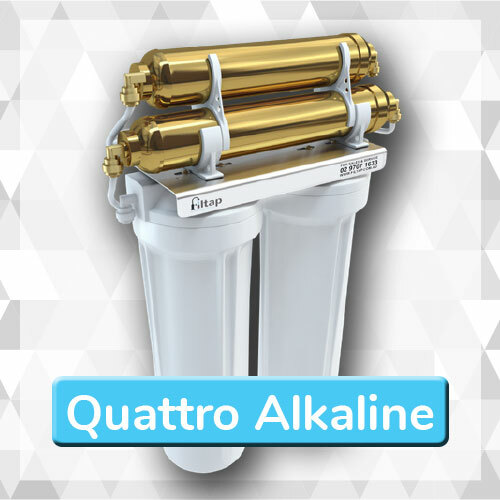 The quattro alkaline filter is not a whole system, however, it can be purchased along with the triple under sink water filter as a four stage system. The quattro alkaline is an additional cartridge that instead of just taking out any impurities from the water, it helps to remove any acidity and gets your water closer to the ideal neutral pH of 7. Filtered water that has gone through our quattro alkaline systems is said to taste fresher than normal water, and we know that you’ll love it. While you may not always be able to easily taste a difference (you usually can), your body will definitely thank you for it and you’ll more than likely want to drink more water – something everyone needs to do. If you’d like to know more about the four-stage quattro alkaline water filter or have a detailed look at the specifications and how it works, just head on over to our dedicated page which will help answer your questions. The PDF brochure download is the best place to look for the serious details – check it out! 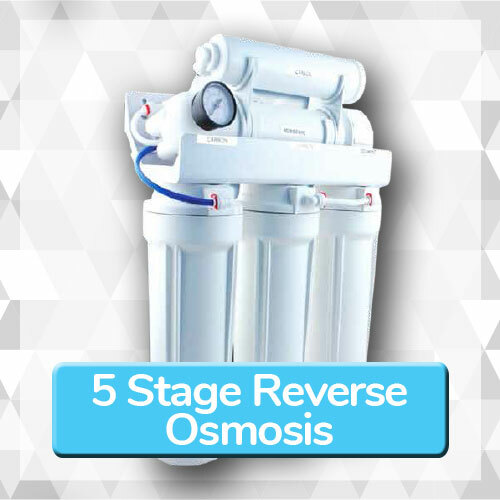 Our 5-stage reverse osmosis water filter is popular for a good reason – water can’t get much purer! With a 5 nanometre filter (.005 micrometres or .000005 millimetres), it’s no surprise that hardly anything other than water can get through. A single water molecule (H2O) is about 0.275 nanometres, which means if it were much larger it couldn’t get through the filter either! This additional ultrafine particle filter is what makes water from our reverse osmosis system so pure. Due to this extreme filtering process, there’s a limited amount of pure water it can produce each day, however, it should be more than enough to supply all of your drinking water needs. The best thing about our reverse osmosis system is that despite the amazing process that it puts your water through, it is still able to easily fit under your kitchen sink. You can check out all the specifications on the dedicated reverse osmosis page and download the product brochure too. If you’ve still got questions about this system, our friendly team are more than happy to answer any questions. All of our under sink water filters are built with the highest quality components and have gone through strict testing. With manufacturing and assembly taking place in the USA, UK and Australia, you can be sure that everything complies with Australian safety standards. Our filters are built using modern scientific principles which means your new under sink filter should last for years to come. We’re confident that you’ll love your new under sink filter and that it will last you a long time. For this reason we provide industry leading warranties on all our products. For the detailed warranty information, please check out each product’s brochure as certain parts of each filter may have different warranty details. Our highly experienced technicians do perfect installations every time, however, if something were to happen to your filter caused by improper installation, our team will come straight away and fix the problem free of charge. 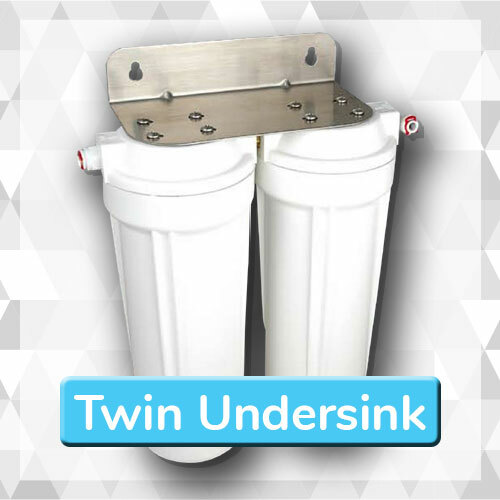 All of our under sink filters have been made with the customer in mind, which includes making our products affordable. Since we get all of our products direct from the manufacturer and due to our massive buying power, we have the best prices around. Free installation means that all of our customer have fair pricing, and we can offer this since our filter technicians can complete installations quickly. An affordable product installed quickly for free by a friendly team – there’s not much else you could ask for! Give us a call today on 1300 734 156 to get your own high quality under sink water filter. While many of our customers are based in Sydney, over the years we’ve continued to expand our service area due to the need for quality under sink water filters outside of Sydney. Our service now reaches right up to the Central Coast and as far south as Wollongong. With this being such a large area to cover, we’ve got a number of teams ready to serve in multiple places around Sydney, Wollongong and the Central Coast – you won’t have to wait long. What are you waiting for? 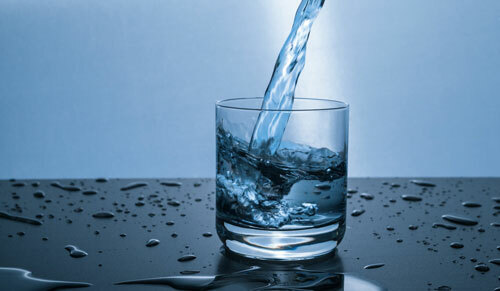 Get a quality & affordable water filter today — contact our friendly team now.